The WaterRower Natural is a beautiful, hand-crafted rowing machine made of solid premium hardwood Ash and stained Honey Oak. Hand finished with Danish oil, the wood is a rich and warm color. 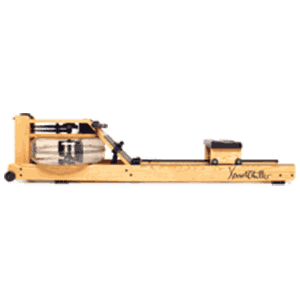 Because wood naturally absorbs sound and vibration, the WaterRower Natural is extremely quiet. Wood also provides extensive durability and stability. This rower’s construction creates an exceptionally smooth row. The WaterRower Natural is also ecologically friendly, as all wood used in its construction comes from replenishable forests.